Having adopted its name from its peculiar shape resembling a mouse, the small islet is Corfu’s landmark. The vegetated rock in the middle of the sea has been declared as an open natural museum and can be visited by a small boat from Kanoni, just outside the famous church of Virgin Mary Vlaherna. 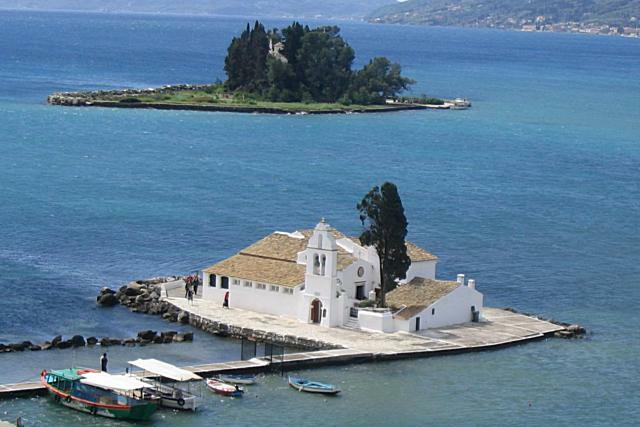 If you happen to be in Kerkyra during the Metamorphosis of Jesus Christ (August 6th) you are in luck as it is the only day visitors are able to visit the islet and the Byzantine monastery of Pantokratoras, which is the only building standing there.